The little sister of the Geniuine Blue Mountain Arabica, also here a sublte balance between acidity and soft character. Long mouthfeel. The coffee is shipped in wooden barrels, not bags. Only limited quantity available and possibly not for re ordering at the same price. 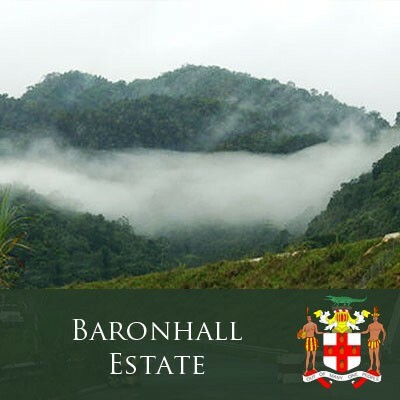 Baronhall Estate is located in the central mountains of Jamaica. Formerly known as Broomhall Estate, the land once formed part of a land grant by Charles II of England to Baron Penrhyn. The coffee from Baronhall Estate is smooth and clean tasting with light acidity, good body and a pleasant aroma. Jamaica High Mountain Supreme is grown at altitudes of 1,500 to 3,000 feet, just under the 3,000 minimum altitude for Jamaica Blue Mountain coffee. Jamaica High Mountain Supreme, like Jamaica Blue Mountain coffee must be inspected and certified as to quality prior to export by the Coffee Industry Board.